The popular Internet radio provider, Pandora made a deal announced today where webcasters will get a "alternative set of rates and terms" from SoundExchange, the group who manages performers' royalties in the U.S. 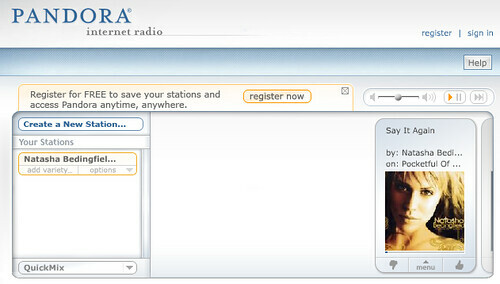 This should put Pandora and other online radio providers in a much better survival position going forward. Pandora was fighting crazy royalty rates where they would have to give up most of their revenue to royalties before, but now will pay about 25% of its revenue based on the new agreement. Users of the free, ad-supported version of Pandora are now limited to 40 hours per month, but if those 40 hours are exceeded in a month users would have to pay $.99 to continue using Pandora through the end of the month. If you use the paid version of Pandora you of course won't have to pay the $.99 fee. If you use Pandora much, the "Pandora One" subscription service isn't a bad deal at $36 a year with a desktop app thrown in and this $.99 fee makes that even more attractive. Seems like mostly a good deal for Pandora and even for Pandora users, but I fear it will cause Pandora to be more locked down and therefor some of the Pandora apps out there might run into more trouble making applications work with Pandora - we'll just have to see that one out. Such is life with the current state of online media though.